We have survived another Thanksgiving. Actually, Thanksgiving was pretty much wonderful. We spent a week or so in Texas with our daughter, Crissy, her husband, Chris, and their two little girls, Jessie and Emily, who are very exciting ladies. Jessie celebrated her 8th birthday with a party at Chuck E. Cheese, and Emily was astonishingly good, considering she’s 5, about the fact that Jessie got presents and she didn’t. We shopped, went out to lunch, took everybody to see The Good Dinosaur, which made everyone over the age of 8, cry. Crissy and I managed to sneak off and see the current Hunger Games movie, Mockingjay Part II, which was riveting. Went to church at Crissy’s fabulous church, First Baptist Church of Wylie, and never got rained on once. John, Crissy and Emily participated in the Wally W. Watkins Elementary School Turkey Trot and Jessie, who had come down with a galloping case of hand-foot-mouth disease, stayed home with Chris and me. A blessing is a lovely Thanksgiving meal at Crissy’s in-laws, Mike and Dianne Brown’s, house where we held hands around the center island where all the food was waiting and said what we were thankful for; pretty much what you’d expect: health, family, except Chris who was thankful for bedtime. We ate too much, enjoyed some champagne, the Dallas Cowboys lost later that evening after we had realized that one more bite of anything would be dangerous and packed it all away. 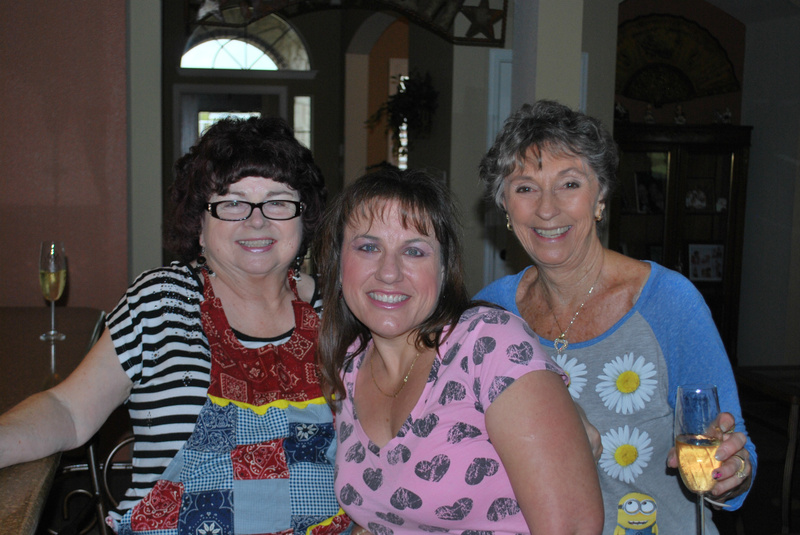 The picture is Dianne Brown, Crissy and me. Put the Jell-O into whatever dish you plan to serve it in. Drain the pineapple juice into the Jell-O but not the pineapple, add the marshmallows, the 2 cups boiling water, the lemon juice and stir till the Jell-O is completely melted. Refrigerate. Keep a close eye on it as you don’t want it to jell completely, just till it’s starting to get firm. Add the pineapple and whipped cream, mix well to be sure all the Jell-O is off the bottom and mixed in. Refrigerate until totally firm. You can add nuts, walnuts or pecans, but only if you’re sure that everyone who is going to eat this likes nuts. Otherwise, you have to clench your teeth while the non-nut eaters carefully pick each and every nut out and set them on another plate. You can double this with complete impunity and great success. My Aunt Helen, who never had children of her own, loved me dearly, sat on the floor with a shaded light and read Winnie the Pooh to me when I had a really serious case of measles; sewed doll clothes for me on her treadle Singer sewing machine, helped me write and memorize a long report on Victoria Falls when I was in third grade, just to name a few, and was a blessing to me all her life.